A Global-NAMRIP project has won one of the major research prizes in Ophthalmology. The project is an interfaculty collaboration within the University of Southampton’s Network for AntiMicrobial Resistance & Infection Prevention (NAMRIP). The participants are from Electronic Engineering; Molecular Microbiology; Ophthalmology (Eye Unit) and Southampton University NHS Hospital Trust. It has produced a flourishing collaboration with Lighthouse in Kenya, and with the Christian Medical College (Vellore, India). The collaboration has developed a novel portable device, using the application of a technology known as electrical impedance, to identify different types of bacteria with no sample preparation and ‘instant’ detection from, literally, a drop of specimen. The prize, The Founders Cup, awarded at the 101st Oxford Ophthalmological Congress, was for a novel approach to identify micro-organisms involved in corneal infections and provide instant identification of bacteria. The Southampton project, led by NAMRIP member, Dr Parwez Hossain, pushed one from the University of Oxford and Oxford University Hospitals NHS Foundation Trust into second place, beating ten other entrants from academic eye units in the UK. The award recognised laboratory proof of principle of the approach using eye tissue models The models were developed by molecular microbiologists in the Faculty of Medicine from residual corneal tissue from the UHS Eye Unit Corneal Transplant Service. The proof used known eye microbial pathogens, to show that different ones can be identified and counted with results appearing almost instantly. The findings of the research have deep implications for the treatment of corneal infections, as this could shorten microbial detection times, currently ranging from 48 hours to two weeks, to only a few minutes. A dedicated prototype device has been set up for clinical samples for patients presenting with corneal infections. Last week the Health Research Authority and National Research Ethics Service approved its use directly from patient samples presenting with corneal infections in the Eye Unit at UHS. With this clinical cross faculty clinical project, the team will be refining the technology to optimise it for clinical application. 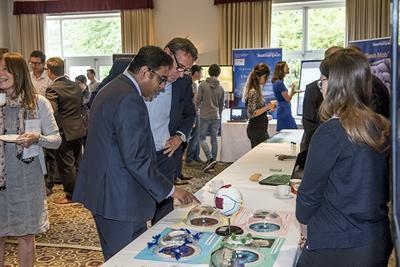 At the 2017 NAMRIP Conference on 5 June, Dr Hossain gave a well-received paper outlining the project and team members also met Lord O’Neill who was impressed by their exhibit, which explained the science, when he toured the Conference Exhibition.